Today's post in the March is for Making series (30 posts in 30 days to inspire making in your school) features one of our lead instructors at the Create Make Learn Summer Institute! Come learn from her and other great maker educators. Early Bird Incentives end March 1. Caty Wolfe’s students make great salsa! Not only does it taste great, it is branded to sell! But good luck getting them to reveal their recipe! It’s a trade secret! Make the best ‘selling’ salsa. In teams, students made multiple iterations of their recipe, collecting feedback and adjusting their recipe. They also worked with other programs to develop a brand for their salsa. Teams had to come up with a unique brand that would appeal to their chosen demographic. Part of their training includes lessons on the role of intellectual property and trademarks. The projects ends with Salsa Day - a final competition when almost 200 people come through the classroom to taste their salsa, view their presentations, and vote on their favorite Brand and Flavor! How did Caty become so knowledgeable about Intellectual Property (IP) and Trademarks? This past summer, Caty Wolfe was selected to go to the US Patent and Trademark Office’s Summer Teacher Institute where, 50 teachers from around the US spent a week learning the ins and outs of IP from those in the know. She even got to meet Scooby Doo’s lawyer! Yup, Avis Frazier-Thomas, Vice President and Intellectual Property Counsel at Warner Bros., came to talk with the group about trademarks! Not only did the educators who attended get to learn from amazing speakers, and walk away with tons of great resources, they also got to put their new knowledge into practices. Caty and her team, even won an award for the most commercially viable invention! So, what should teachers and students know? The purpose of IP laws is to protect the rights of the creator to their work and to protect the consumer from product confusion. In our rapidly changing world of social media, open source, and collaborative making, case law is constantly changing the landscape. 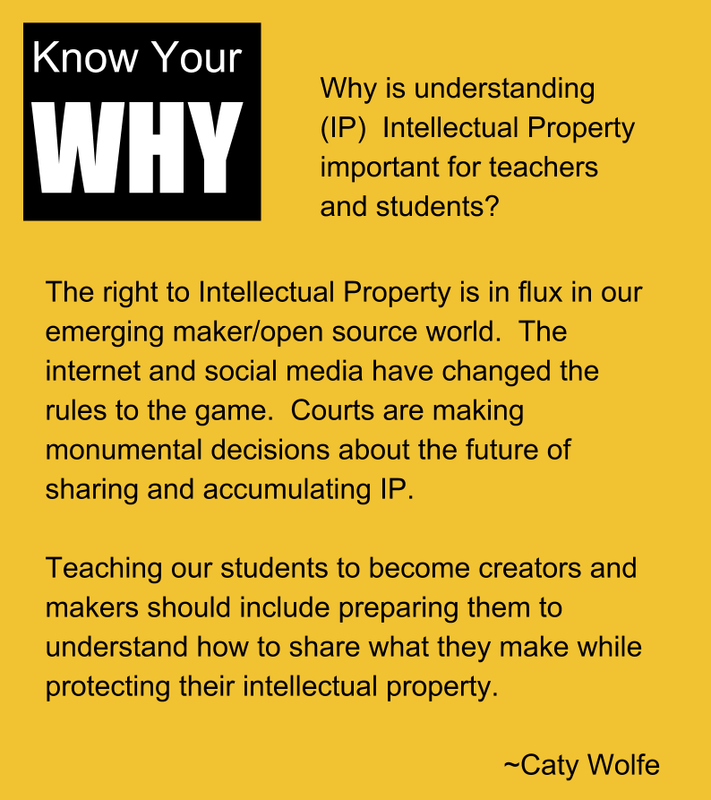 Teachers are regularly creating IP and may not even know it! Do you know who owns the rights to your IP? If you work at a school, chances are they own anything you create with their equipment on their time. Does that mean you own what you get paid for on Teachers Pay Teachers? What about student work? If a student creates something at school in the makerspace and wants to patent it, who ‘owns’ it? Everyone involved in the creation of an invention has to be listed on a patent, otherwise the patent is void! Who counts as involved? These are great discussion questions! Trademarks are any word, name, symbol, or device (or any combination) used to identify the source of products and services and distinguish them from other sources. Our students are bombarded with logos and images and marketing everywhere the look. A trademark is key to brand recognition. They can be names, places, portraits, acronyms, series titles (can’t be one thing), colors, packaging design, sounds, or scents. Unlike other forms of IP, a trademark is valid as long as it is being used to represent the company, product, or service (with a small maintenance fee every 10 years). Did you know NBC had the first sound only trademark in 1950? Check out https://www.uspto.gov/kids/sound.html to see if you recognize any of these other sound trademarks! Patents are protection for ideas or inventions. A patent protects your right to exclude or prevent others from making, using, selling, or importing your invention. They can only protect you in the US, though, which is why there are so many foreign knockoffs. You don’t have to have a physical model, just technical drawings detailing the idea! To patent an idea, it must be new, useful, and non-obvious. A utility patent is what most people think of and protects devices and ideas. This is everything from a switch design to a barbie doll’s articulated joints. A design patent protects the way something looks, like a coke bottle or a cabbage patch kid. Designer plants can be patented. All of those crazy petunia varieties each can have a patent! The USPTO has amazing resources on their website. 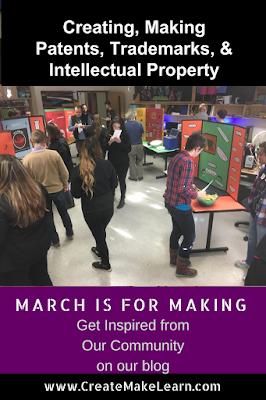 There are activities for kids and teens, a searchable database of patents and trademarks, and tons of resources for applying for patents and trademarks! And they have fantastic videos on Innovation! 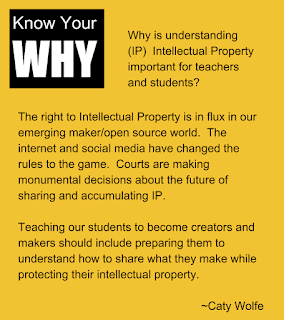 You can learn more about the USPTO Teacher Institute on their website.